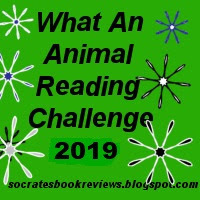 Welcome to the 2019 What an Animal Reading Challenge. I began hosting this challenge in 2010, when I took it over from Kristi at Passion for the Page. I love reading books that feature animals and am going to host this one again. I hope you will join me. The challenge will begin on January 1, 2019 and end on December 31, 2019. 3. Challenge runs from January 1, 2018 to December 31, 2018. 8. You don't have to have a blog or write a review, but you can if you want to. If you don't have a blog, just post in the comment section that you'd like to join. You can post your books in there. Or you can sign up by joining my group on Goodreads for this challenge by clicking here. 10. To sign up, use the Mister Linky below. There will be links for reviews and wrap posts later. That's it! Enjoy and have fun! I'm in again for Level 4. Thanks for hosting again! Level 4 again. :) Thanks for hosting! All in for level four! Just getting my feet wet with level 1. Not sure about this one, but looking forward to it. So, Level 1 for now.